This is the first time I’ve read the teen edition of one of Mr. Lucado’s books and I’m sad to say I didn’t enjoy it as much as his adult books. Don’t get me wrong, he is still an incredible author and pretty much the only non-fiction author I will read, but I was a little disappointed. The layout of the book was extremely nice, with fancy chapter headings, pop out quotations and such: really gorgeous. The story was adapted for teens by James Lund, but I felt the adaptation was a little too “hip” which I didn’t like, but I’m sure the younger crowd will appreciate, such as the references to Lady Gaga and other “teen” things. One of the things I always LOVE about Mr. Lucado’s books is that he includes real life stories that he seamlessly weaves into the point he’s trying to make. These are usually the parts that really touch my heart. These stories were handled a little differently this time and instead of Max telling us about them himself, they come in the form of letters written directly by the person. I didn’t like this format as much and was actually most touched by the one story not in this format, the story of Barbara Leininger and her sister, Regina who were taken captive by Indians in 1775. As I read through this story on a bench in the school hallway I found myself blinking back tears and willing myself not to cry. 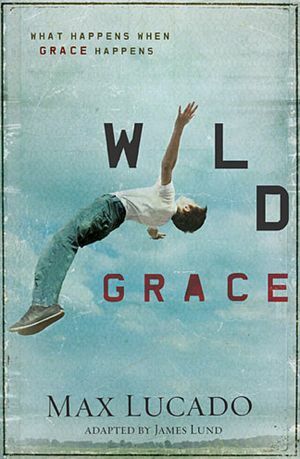 I enjoyed this book but I couldn’t help but wonder if I would have enjoyed the adult version Grace better. I want to read the adult one now so that I can compare the two. I think I’ll stick with what I know and love and continue to read his adult books and pass on his next teen edition. This entry was posted in 3 Hearts, Non-Fiction, Young Adult and tagged Booksneeze, Max Lucado, Thomas Nelson, Wild Grace. Bookmark the permalink. I debated whether to leave a comment. I'm not a Max Lucado fan. But, I do applaud his effort to reach teens. Teenagers react from their emotional body, as so many will not develop their mental body until their mid-20s. It's such a hard time with so many influences from peers, the media,society etc. Some have a well-grounded faith and others don't. I hope his book reaches those lives in need of hope and help. Enjoyed your comments. I'm glad you decided to comment Pat. It can be really hard to reach teenagers but I hope this book is able to make a difference to those who read it. He has SO many books it can be hard to keep track! I definitely still want to read Grace, I'm sure they are very similar but I think I'll get more out of the adult one. If you think you want to read this one I'd be happy to send you my copy, just let me know =) I would recommend both Fearless and Great Day, Every Day. I loved both of those!